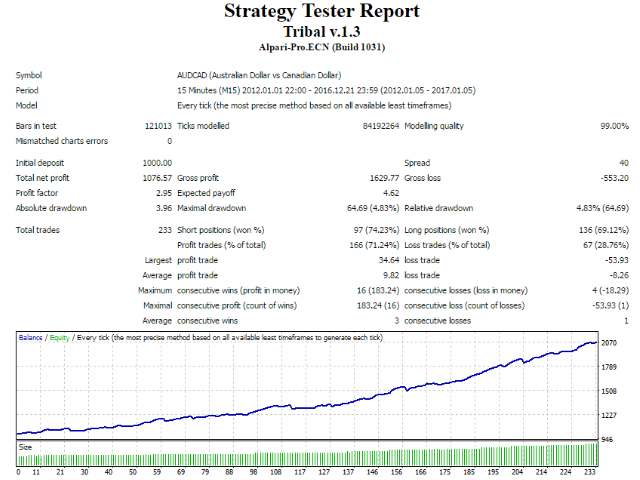 Tribal EA is the newest conservative trading Expert Advisor with a powerful order control filter, the development of which took the last six months. The EA does not use martingale, averaging or similar risky techniques. It always uses stop loss, tale profit and order closure based on additional filters. All appropriate settings are stored in the Expert Advisor code, so there is no need to download additional set files - you only need to attach the EA to recommended pairs. The settings are valid for GMT+2 brokers. If your broker's time differs, set the appropriate value of TimeShift. You can also choose and use custom settings. Deposit: $200 per 0.01 lot. All settings in points are given for 2-digit (JPY) and 4-digit quotes. Values are automatically multiplied by 10 for trading accounts with 3- and 5-digit quotes. UseAuthorSetFiles - use optimized properly tested unique sets. Set to false if you want to trade using your custom parameters. Set Name - the name of the user created set file. Lots - default lot value. Auto Risk % - risk value as the percent of deposit per trade. The parameter is ignored if Lots is set to true. Max Spread - the maximum allowable spread value, above which the EA will not open orders; in points. Dynamic TP Channel Percent - take profit value as the percent of the channel width. Static TP is disable if the parameter is set to > 0. Hedging Orders - allow opening opposite orders when a signal appears. Filter Max Candle Size - maximum value of the previous candlestick, orders will not be opened if the candlestick was larger. Pause After Stop Loss - stop trading for the specified number of minutes after a losing trade. 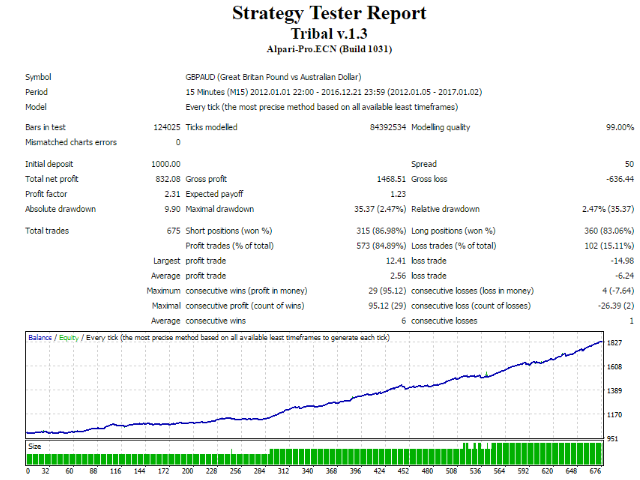 Trailling Start - the distance in points from the opening price to activate Trailing Stop. Trailling Distance - distance of trailing stop from the current price. TimeShift - broker's time shift. Can also be a negative value. hi, I purchased this EA, the Trading pairs is: AUDCAD, EURCHF, EURJPY, GBPAUD, GBPCAD, GBPUSD , But I saw the signal you provided and it traded: AUDCAD, EURCHF, EURJPY, GBPAUD, GBPCAD, GBPUSD, AUDUSD , CADJPY , USDCAD in the history, should I trade these 9 pairs too? 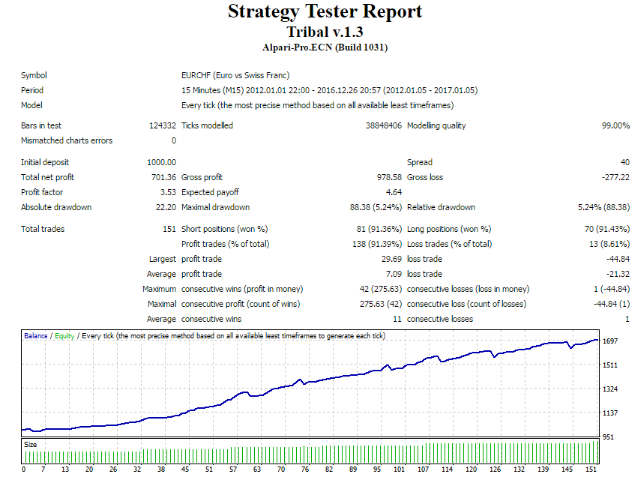 - Added new parameter "Raise Lot After SL (Multiplier)". If the parameter more 0, lot of the new order will be multiplied to it if the previous order was closed by Stop Loss. When current order close with profit, the next order will opened with a regular lot. 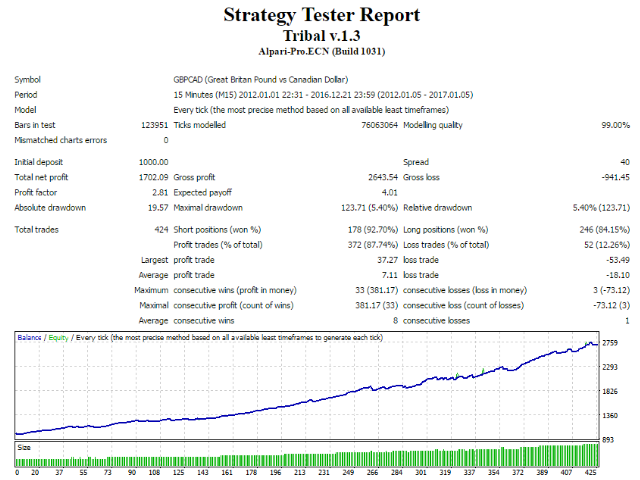 - Removed the automatic unloading of the EA from the chart when the "AutoTrading" button is released. (the EA was removed from the chart during synchronization with the MQL5 VPS).